Posted by hautmaj on Thursday, January 11, 2018 in Newsletter Article Posts. Spring Registration for Vanderbilt chatELC is now open! 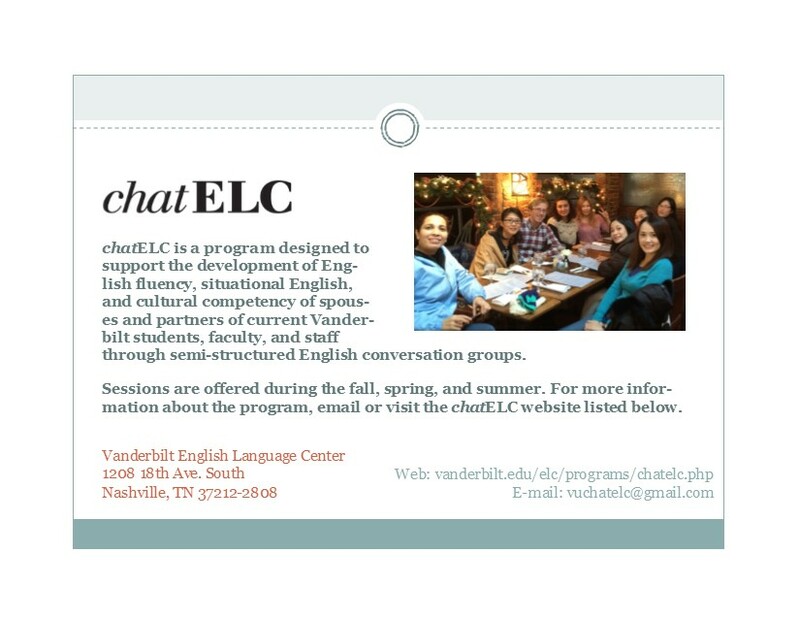 Vanderbilt chatELC is a program designed to support the development of English fluency, situational English, and cultural competency of spouses and partners of current Vanderbilt students, faculty, and staff through semi-structured English conversation groups. The conversation groups will be led by Group Leaders from the Vanderbilt community and meet for 11 weeks in the Spring. The sessions will begin the week of January 22nd, but the exact times and days will be decided when the registration period ends. All sessions will be held on campus at the Vanderbilt English Language Center. 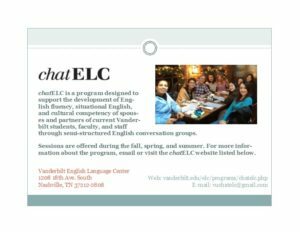 These conversation groups are open to adults at any level of English proficiency, but designed for those with low to intermediate levels of proficiency, who are interested in discussing American and other participants’ cultures, learning about Nashville and the Vanderbilt community, and improving their conversational English. If you would like to register, please fill out the link below.